Washington Food Truck Insurance. Owning a food truck means maintaining an optimal level of business liability insurance in the coverage types that matter most for your specific business model. Sadly, a study in recent years found that up to 57 percent of litigation against businesses involved business with revenue of less than $1 million per year. Food truck operators often make the mistake of thinking that their businesses are too small to get sued, but in fact, small businesses take the most heat from litigious clients. Protecting the investment you've made in your business requires a comprehensive Washington food truck insurance policy that protects you from perils. 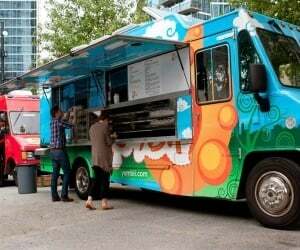 Washington food truck insurance protects your business from lawsuits with rates as low as $27/mo. Get a fast quote and your certificate of insurance now. Washington food truck insurance ensures that if your business is sued for some accident, food-borne illness, or injury, your business is protected. Business insurance for a food truck business ensures that if your business is sued for some accident, food-borne illness, or injury, your business is protected. Even if you are sued and come out the "winner," you're still responsible for paying your lawyer and other members of your defense team. Washington food truck insurance can provide a buffer of protection so that these costs do not come out of your pocket. Do You Need WA Food Truck Insurance? Essentially, any public or private area where your business sets up shop to sell its wares presents a potential for liability to your business. This is true whether your WA business operates from a primary location or from several different places within the same city, or if it moves from business parks to fairgrounds and beaches. Concessionaire insurance is a necessary expense and it should reflect the risks that your business takes on during its operation, and regardless of what you're selling - whether it's foods, T-shirts and souvenirs, or other goods. For WA concession businesses that sell food or that cater to events and weddings, it's important to stay covered from potential liability at every event and location you work. In addition, local, state, or federal law may also require the purchase of such insurance. Either way, your business' success in the future depends on safeguarding it from peril now. There are all sorts of scenarios where your business may find itself on the ugly side of a lawsuit. Protect it with Washington food cart insurance to make sure it doesn't cause you to lose your business or your own personal assets. General liability coverage that protects the business from damages and costs due to an irresponsible action on the part of your WA business or its employees. Inland marine insurance to protect your products and inventory as you move between WA locations. Worker's compensation insurance to cover the costs of employees who are injured or become ill due to a work-related accident or peril in Washington. You can tailor the Washington food truck coverage you purchase to suit your business' particular model. A business owner policy, also known as BOP, often provides the coverage that businesses need in one simple policy. You can work with an agent to find out if your business is protected fully by a BOP or if addendums and additional policies are required. Request a free Washington Food Truck insurance quote in Aberdeen, Anacortes, Arlington, Auburn, Bainbridge Island, Battle Ground, Bellevue, Bellingham, Bonney Lake, Bothell, Bremerton, Burien, Burlington, Camas, Centralia, Chehalis, Cheney, Clarkston, College Place, Covington, Des Moines, DuPont, East Wenatchee, Edgewood, Edmonds, Ellensburg, Enumclaw, Ephrata, Everett, Federal Way, Ferndale, Fife, Gig Harbor, Grandview, Hoquiam, Issaquah, Kelso, Kenmore, Kennewick, Kent, Kirkland, Lacey, Lake Forest Park, Lake Stevens, Lakewood, Liberty Lake, Longview, Lynden, Lynnwood, Maple Valley, Marysville, Mercer Island, Mill Creek, Monroe, Moses Lake, Mount Vernon, Mountlake Terrace, Mukilteo, Newcastle, Oak Harbor, Olympia, Othello, Pasco, Port Angeles, Port Orchard, Port Townsend, Poulsbo, Pullman, Puyallup, Redmond, Renton, Richland, Sammamish, SeaTac, Seattle, Sedro-Woolley, Selah, Shelton, Shoreline, Snohomish, Snoqualmie, Spokane Valley, Spokane, Sumner, Sunnyside, Tacoma, Toppenish, Tukwila, Tumwater, University Place, Vancouver, Walla Walla, Washougal, Wenatchee, West Richland, Woodinville, Yakima and all other cities in WA - The Evergreen State.